Felt the force of His cry. Nor the prayer before Kidron and betrayal. Your part in the savage charade? The kingdom conquered through dying. To see Him and know Him. Holy Week is upon us and this year, Luke's Gospel graces our ears with the Christ who comes to set us free from the tyranny of evil. Okay, that sounds excessively poetic so let's call that Gospel what it really is--The Star War's Gospel. You know what I mean. A battle of light against darkness, good against evil. For that is what Luke's Gospel holds for us. C.S. Lewis coined the term that best explains humanity's situation on earth before the coming of Christ. He called it "enemy-occupied territory". Jesus comes to do battle with Satan, the real enemy. And it is a cosmic, knock-down, world wide wrestling federation battle. Did you ever notice that in Luke's Gospel there are no terrible people? Even Pilate is made to look pretty good compared with the other Gospels--the same can be said of the Jewish leadership and the Romans in general. Even the people who call for his crucifixion get forgiven by Jesus. Why? Because our sinfulness hearkens back to Satan and the power of evil, and that is who Christ defeats on the Cross. He has such compassion for humanity that he can even forgive the Good Thief. I love the Welsh poem I reprinted above. In our own weakness and sin, may we be be comforted by the fact that someone even worse was given Paradise the day Christ died, all because he looked upon the Lord and asked to be remembered. May Christ remember each one of us this week as we walk with him to Calvary and beyond. 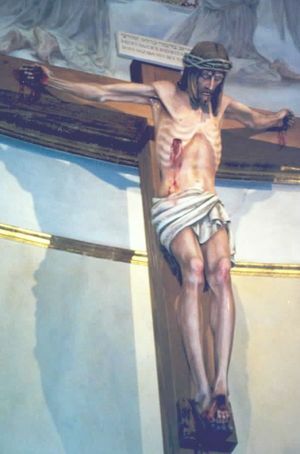 (The picture above is of the crucifix at St. Mary Church, Durand, Illinois where I am pastor. Carved in 1926, it has recently been restored). May your Spirit cover all with gentle breath. The budding world reminds us in the middle of Lent that the Cross of Christ is the Tree of Life. May the coming of spring warm your heart and give your soul hope as the Light returns and the earth brings forth life as a song of praise to the Creator. A BLESSED AND HOLY ST. PATRICK'S DAY! I sense the Presence of the Christ here. The voice of God in his heart. You lit a fire not to be quenched. I rest here in this holy place. The holy land of Ireland. May I hear its song forever. along the pass at Mamean. I am part of the land. I wrote this little poem on a summer's eve as I sat by the open altar at the holiest shrine in Connemara in the middle of the Maam Turk Pass. St. Patrick was said to have visited here and a holy well is dedicated to him. A chapel, an open altar and stations of the Cross make up this site. It is not modern. It's been a place of pilgrimage for well over a millenia and a half. I scribbled myself a note: "A wonderfully mysterious mountain, Binn Ramger is across the valley before me and the beautiful, peaceful little lake nestled there at the foot of the mountain reflects the shadows of a dying day. The sun is setting; I hear a sheep bleating down by the lake. Like the sheep that eke out a living at the foot of Mt. 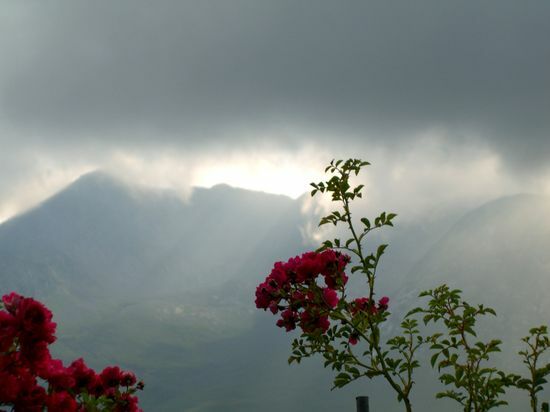 Sinai, so these wander the hills of this holy place that resonates with the power of Christ, the Good Shepherd." 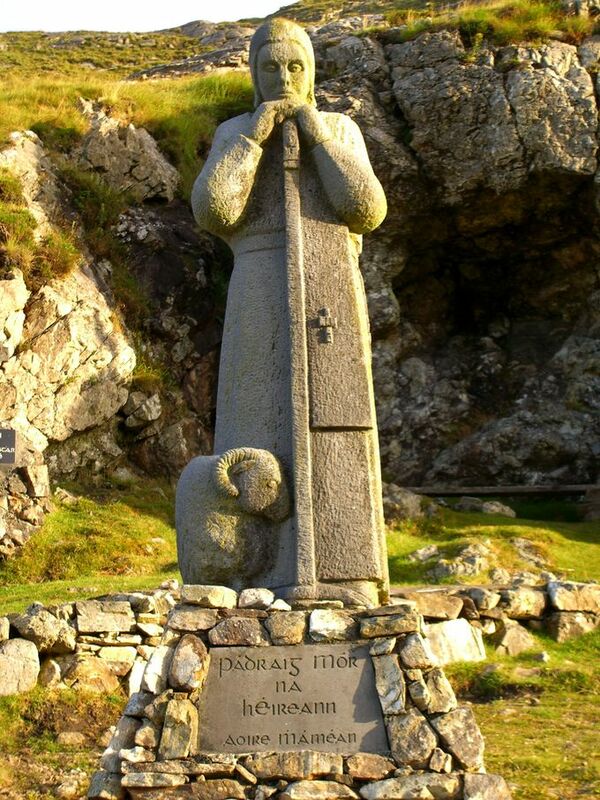 The statue of St. Patrick that stands in this valley shows a young Patrick while he was still a shepherd/slave of one of the minor kings of Ireland. He had been captured by pirates when he was sixteen and it was in valleys such as these that he first heard the voice of God speaking to him. An amazing thing really. He heard the same voice as did the druids, but only he figured out who was really speaking. And when he grew up and confronted those druids; rather than kill him, they listened to him and believed. He could hear and see like they could not. But he must have been able to speak clearly as well , since the conversion of Ireland was an unbloody one. A curious thing about Patrick: he used the same power as the druids did. Many think he just converted the land simply by great homilies or sermons, but actually, he showed the druids and the people that the power he wielded was greater than their's. For the druids, a nature magic was what they practiced, but Patrick simply let the power of God work through him. In essence, he proved to his people that magic was inferior to faith--doesn't sound like a big revelation to us, but think about it for a moment. Magic seeks to give humanity control over everything; faith seeks to let God work through us. Magic is about pride; faith about humility. In a world where we seek to master even the basic secrets of life itself, Patrick has a great message for us. The Shepherd of the Hills learned to do great deeds and wield great power, but always he knew it was Christ working through him. That's why he's a saint and remembered, and those who opposed him are as vanished as the autumn grass in the Pass of Mamean.